Ed Lytle grew up in Akron, Ohio. His mom always took him and his sisters to his grandparents’ church, but when he was eight a church was built closer, and his dad started attending. Ed saw the change in his dad’s life and says that’s what brought him to the Lord. Just before starting high school, Ed’s family moved to Hartville (OH). He was quite shy, but nevertheless got involved in football and track. He joined his church’s youth group, and worked summers at Bible camp. In Ed’s junior year a missionary from Canada came to Liberty to talk of his work among First Nations. As he spoke, it reminded Ed of childhood family vacations in Ontario, his love for Canada, and it gave him direction. Karen Gilbert was born and raised mostly in Virginia. With the support of a Christian home she gave her life to Christ early. Karen also attended Liberty, wanting to grow in her faith. “In my freshman year, and first time ‘on my own,’ God became even more real in my life,” Karen recalls. The Lord gave her a desire for missions and a short-term overseas experience … and somehow made sure that she and Ed ran into each other! They were married March 1981. By the end of June the newlyweds were on their way to Weagamow, an Oji-Cree community in northern Ontario, with $100/mo. support from their home church. Native Pastor Albert & Rhoda Tait took them into their home, allowing them to learn about life and ministry. The Lytles soon found out that they couldn’t actually live on $100 a month, “but God blessed us and provided in ways that, still to this day, have been a foundation for trusting Him,” they say. At Weagamow they ran into the NCEM Tribal Trails TV crew. Ed & Karen sensed that God was leading them to apply to NCEM … and the crew even had applications with them! By September 1982 the Lytles were serving at Key-Way-Tin Bible Institute in Alberta with their newborn son. A year and-a-half later they moved to Norway House, northern Manitoba. 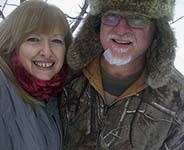 Ed & Karen continue to serve there with Norway House Bible Church. It’s where they raised their four children who, naturally, think of it as home. (from Issue #532) Note: some of the locations and involvements of our missionaries may have changed since the original publishing of this article.